Do your own DIY install of a Linear French Drain with Tim Carter's time-tested methods and materials! 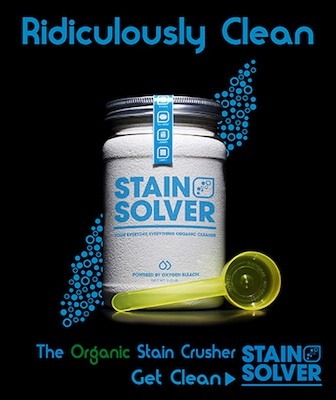 CLICK IMAGE TO ORDER NOW! Watch french drain pipe video below! DEAR TIM: Every spring, soggy soil in my yard prohibits me from getting a start on my spring yard chores. During periods of heavy rain, water flows toward my house causing periodic flooding. DEAR BETSY: I've got some great news for you. You can prevent basement or crawl space flooding and dry out the soil by installing a simple trench drain. Your early spring fever problems and flooding concerns can be cured permanently with some simple linear French drains. Some people call these ingenious in-ground gutters trench drains because you dig a trench. Normal soil makeup consists of small pieces of rock, organic debris, water, and air. In many soils (especially clay soils), the air content is highest in the upper 24 inches. As you go deeper into a soil, the weight of the overlying material compresses the soil and squeezes out the air. When it rains, water enters the soil and pushes the air to the surface. Gravity then takes over. CLICK HERE to get FREE & FAST BIDS from local landscapers who can install your linear french drain. If your yard slopes and every yard and neighborhood has some slope, the water within the soil actually begins to flow downhill. Level yards suffer as the movement of the water through the soil is minimal. You can accelerate the movement of water or intercept and re-direct sub-surface water by installing gravel covered perforated drainage pipes in narrow trenches. Water, just like most things, takes the path of least resistance. Subsurface water would much rather travel through gravel and open drain pipes than force its way through the soil. A linear French drain is simply a "moat", or gutter-in-the-ground, that protects your yard or house from sub-surface or surface water. You construct it by digging a 6-inch wide trench approximately 24 inches deep. Cross-section of a Linear French Drain including the all-important perforated french drain pipe. Copyright 2017 Tim Carter ALL RIGHTS RESERVED - Do NOT COPY this graphic. If you want to intercept sub-surface water to dry out your yard, you install the trench along the highest part of your property. Extend the trench to the lowest part of your yard. If your intent is to protect your house from water, you construct the trench approximately 4-6 feet away from the foundation. In many cases, the trench system is U shaped as it passes around your house. Lots that appear flat often have sufficient slope that allows you to install the pipes so that they will extend to daylight at the lowest portion of your yard. You can use the optical or laser builder's level to tell you the high and low portions of your lot. The bottom of the trench can be level or it can follow the contour of your yard much like a fence. If you can expose the end of the pipe to daylight at the edge of your property, you will obtain the best drainage results. Watch this video to see water flowing out of a perforated french drain pipe in my own yard! You can't believe how well these work. Once you have the trench completed, compact any loose soil in the bottom of the trench. A 6-foot tall 4x4 works well for this purpose. Wear gloves to avoid getting splinters. Install a 1 or 2-inch layer of washed gravel on top of the compacted soil before you install the perforated piping. Do NOT lay the piping directly on the soil. You want the drainage holes through which water will enter to be up above the soil. If you choose to use rigid plastic pipe that has two rows of holes along each length, be sure to install it correctly. The holes are supposed to point down, not up towards the sky. The reasons the holes should point down are many. Remember that the water table in the soil builds from the bottom to the top of the soil profile. If the holes point down, the water enters the pipe sooner than if the holes pointed up. Also, water droplets or flow is not intelligent. It can't "see" the holes in the pipe and aim for them as it flows down through the gravel. Some water may find its way into a hole pointing up, but most of the water will flow around the pipe and then build up until it can flow into the holes. Furthermore, holes that point up are perfect targets to get clogged with the rounded gravel. Always keep in mind the pipe is acting as a conduit for the water and the water table in wet periods is already up to the bottom of the holes. If the water table rises higher than the holes, then water squirts vigorously into the holes and is carried away by the pipe just as water charges down a stream bed in nature. After the pipe is installed in the trench, cover it with 1 inch or larger washed, rounded gravel. Fill the trench with gravel to within 1 inch of the surface. 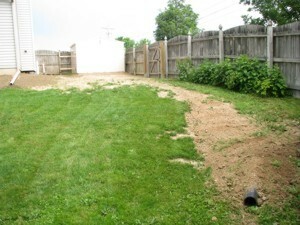 Place a piece of sod over the gravel to disguise the trench. If you wish to control surface water that flows over your lot, allow the gravel to extend completely to the surface. If you widen the trench in the upper few inches of the soil, you can disguise the drainage system. Use colored stones, gravel or large stepping stones to create a walkway. To further enhance the illusion, install the trench with gentle curves as it traverses your lot. Do you wonder if linear French drains really work? A year ago last spring, I called your radio show from my home in Vienna, VA. I described my problem with water in my basement. It was very predictable, every time it rained 2" or more in 24 hours I would get water in my basement. Anyway, you advised me that a French drain would solve my problem. So I rented the ditch witch and got a bunch of friends, following your on-line tips we installed the drain. Your tip about the plywood to have the dirt flow onto was a great labor saver. We did have a lot of trouble with rocks and tree roots stalling the machine but in the end it was a job well done. Of course our work and your advice caused the drought in the Washington, DC area. We waited almost a year and a half before we got to really test the French drain. However when hurricane Floyd came through and gave us 4" in less than a day and the basement was high and dry I figured it was worth the drought. Now the neighbors are asking my advice, and I point them to your web page. When we talked you said to let you know how it worked out. It worked out great!! 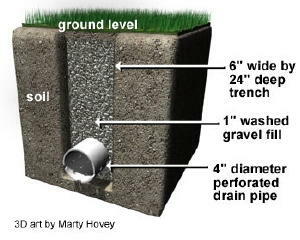 The straw layer mentioned in the column above is not necessary if you fill the entire trench with gravel to within one inch of the top. The reason is simple: Silt does not pass sideways through topsoil. The silt that turns stormwater runoff brown is eroded soil particles that are running in overland flow. 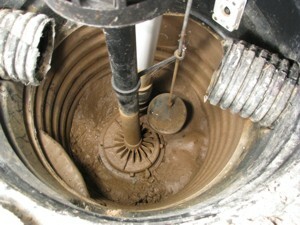 Silt particles get trapped and filtered in the upper layers of top soil. The vast amount of water captured by a linear French drain is water traveling sideways through soil. It is generally clear and free of silt. To prove this point, spring water and water taken from underground wells is almost always crystal clear. The silt was left behind at the surface as the water was entering the ground. We have a block and beam foundation, clay soil, no gutters and we end up with pools of water right next to the house and sometimes covering most of the back and side yard. In some places the water goes under the house. Because the soil is already about 6" or less from the wood siding and we need to maintain ventilation we can't build up with additional soil. It seems that if the trench is 4-6' from the house that a lot of water will still be pooling and going under the house. Mr. Gardner from Houston, Texas. It is important that you put the drain that far out because if placed close to the house, the French drain acts like a vacuum and pulls the water through capillary attraction. You would be pulling the water to the house. You need to create a slope from where the soil hits against the house to a spot about 6 feet out. Since you cannot do this by adding soil ... remove some. Create a slope and install the linear French drain. 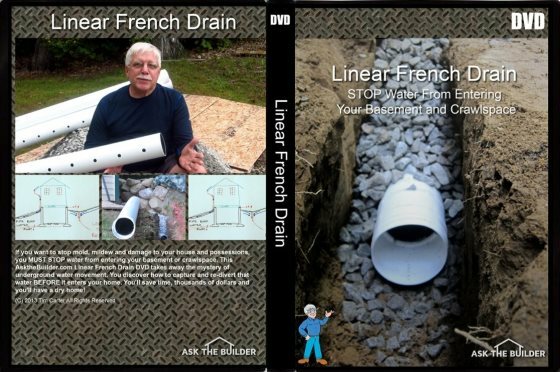 Click here to order Tim's DVD with the step-by-step procedure for installing a Linear French Drain and keeping your basement dry. "Hi, I just wanted to write to give you the results of my "Trench Drain". I have had a wet crawlspace for 15 years. Water would fill the crawlspace at times, so we actually had to drill weepholes at the base so that it would enter the basement and eventually, the sump pump. I have tried everything. Several contractors said that the only thing we could do was to bring the water into the house via drainage tile and let it enter the sump pump. That would work, but because I live on a 6' elevation, there is no reason that I should have water problems. It became like clockwork...when it rained, we would rush home from the lake or wherever we were vacationing so that we could be prepared to start the backup generator, in case the power failed. We even had our alarm company put a sump alarm on our system, so they could notify us if we had a power failure. Battery backup was not an option, because sometimes we loose power for days and during any rain, our sump would run every 7 minutes...just like clockwork. I found your site and read the article on the trench or French drain. At first, it sounded a bit like "holistic healing" to me. I failed to understand why a 2 ft. deep trench, 4 ft. away from the house would do any good. How could this simple thing correct an extreme water problem that has plagued me for years, cracked my foundation, settled my garage floor and ruined almost every vacation? I decided "what the heck". I had to dig by hand using a trenching spade and a pick-axe, because the builder back-filled our property with brick and blacktop. It took quite a bit of time. Because the ground level varies so much on that side of the house, I was not able to achieve exactly 2 ft. deep. It varied from 18" to 30" in spots, but the slope was downhill. The trench is about 80 ft. long. At times, I thought about filling it all in, because I just didn’t believe that it would work. I stoned it, put tile in, and filled it with #1 round stone. I socked the pipe just for safety measure and I also used geotext fabric on top, so I could cover with dirt and grass. I also ordered some clay and pitched from the house to the drain. Result? For the last month, we have had 7 or 8 torrential rains, the worst of which was last night. It rained so hard, that our lawn washed out in spots because of the high clay content. Our sump pump, that normally ran every 7 minutes during and after rain, has not turned on for 4 weeks. The silt at the bottom of the sump well is now dry and cracking. Our crawlspace has not shown a trace of water or even moisture. Since I couldn’t see correcting the foundation cracks or the garage floor settling and tilting until I corrected the problem's source, I waited to see if the trench drain worked first. This week, I had a company come in and perform sort of a "mud-jacking" technique on the garage floor, which worked perfectly. Also, during the past few weeks, I parged the cracks in the foundation. I just wanted you to know how this worked. I stressed for many years over this issue and the solution was nowhere near as difficult as I thought it would be. As a side note, I went to the end of the drain tile during a hard rain to see what was happening. Water was running out of the drain tile in about the same exact volume that it previously ran out of the weep holes in my crawlspace. This winter will be interesting, because last year, the ground next to the house was so saturated that during a thaw, my sump would run constantly. I'm guessing that the ground between the trench and the house will probably be drier now going into this winter." Want a step-by-step procedure on installing a Linear French Drain? 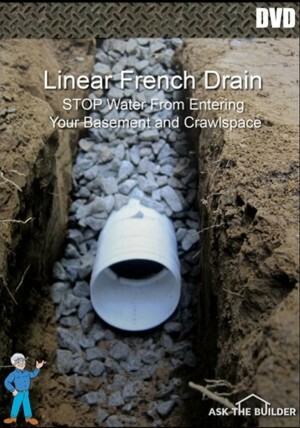 Tim's Linear French Drain Video Series DVD shows you how to keep your basement and crawl spaces dry. CLICK HERE or on the image below to order Tim's DVD. Hello Tim, I have gone ahead and began construction on my trench drain. It is on the east & south side of the house.Have used the 3" rigid pipe with holes(facing down).The line to daylight has a descent slope to it. I am also using this trench to daylight to run the 1 1/2 " sump pump discharge (solid)layed it right on top. My question is: I also would like to tie in the gutters to to this trench to daylight,by laying another 3" rigid (no holes) pipe next to the sump pump line,and then covering all with stone.It would save the work of making another trench.Would this be alright? Mike, you should consider investing in a 15-Minute Consult with me. Look at my cart for that. Lot's to discuss. I just do short pithy answers here. Help! How can I find a landscaper in the Baltimore area to do this? This sounds like exactly what I need to stop the water coming into my crawlspace. Scott, you need to do a 15-Minute Consult with me. Look at my cart for that. I can tell you how to find the right person. Your instructions installing the drain pipe after digging the two foot trench indicates tamping down the soil, adding one inch of rounded gravel before lowering the pipe and then covering with "gravel". Is the top layer of gravel a different type than the rounded gravel? No. But it can be. It just needs to be very permeable. the other pump do double the work? I live in New Jersey. If I understand you, the second pump works. It will pump as long as there is water and electricity. HELP! We own rental property and have installed about a half-dozen French drains - all successful. We did one last week-end on a new piece of property. The drain is excellent; doing it's job to perfection. However, the dry well is overwhelmed and is causing the the water to back up into the drain pipe. We knew this was a possibility and we installed the dry well with a straight shot to the street if the worst happened. Now we have to tap into the system and take it to the street. Should we install a lower pipe in the dry well, or should we cut the drainage pipe a few feet back from the dry well and tap into it there? Janet, Walter, this is what my 500-Second Consult is all about. Click the Shop icon at the top of the page! What do you do if there is no where to extend an open drainage pipe? Can you extend the pipe to a large gravel filled well-like underground hole? We live in a city surrounded with street and curbs in the front, paved alley in back and neighbors on both sides. There is almost always a low spot to daylight the pipe. Hi, J. Stanton's question applies for a house I am considering buying. Basement gets water, ground gets quite wet, gutters not working well now (before purchase) and neighbor says previous owner pumped water to street, it iced up, other neighbors complained. If I were to install a linear French drain as you recommend there is no place where it could open to daylight given the layout of the land. Could it go to gravel pits? Also, the basement door opens to a concrete slab that collects water and appears to have no drain, and whose level is below where the French drains would be. Any ideas to fix this? Gravel pits in the ground FILL with water as the ground gets saturated. They're USELESS and a folly. Don't buy a house with drainage issues. Go find another place. How long should a French drain be? In all of the articles I've read they talk about height and width of the drain but not about length. There must be some guidelines or formula for square feet of roof plus average gallons of rain coming off the roof plus type of soil = length. How deep and wide should a drywell be for removing rain from a gutter/downspout? Deeper and wider I'm sure would be better. We live on top of a sand dune, so the drainage already is good. Can I ask why you do not recommend wrapping the pipe/gravel in any sort of pipe sock or landscaping fabric? I am installing a very similarily designed trench drain to yours, however, i was going to use a pipe sock, as well as wrap all the gravel and pipe within landscaping fabric. I cover this in my Linear French Drain DVD!! French Drains and Geo-Fabric? I am installing a French Drain and noticed that in your article, you didn't mention the need for geo-fabric to line the trench. Is the fabric necessary or a drain sock? You need my Linear French Drain DVD!!!! Okay, once the drain pip is installed the water will enter it and travel down the grade to where? Do I terminate to a gravel bed, just let it open end and flow downhill into the yard (We live on a slight hill, thats a part of the original problem) or what? This might fit into the "stupid question" category but I'd rather appear a fool than hire some contractor to fix my mistakes. Thanks! what is causing water to come to the surface and run all winter months and freeze and thaw when warm .this is causing troubles to the side walk out front of my home .the water runs across my neighbours yard down across to my front yard .is there a under ground stream causing this .its getting bad because its been very cold this winter here in Dartmouth nova scotia .what can be done about this before there is lawn and home damage along with pedestrian's getting hurt on the side walk. Lots to discuss. You need to schedule a 15-Minute Consult with me. See the SHOP icon at the top of the page? Click it. Go to Consult Tim in the left column. Tim, it's been recommended to me that due to the volume of water I receive I ought to lay 2 pipes in my french drain. I also plan on running my gutters in a closed pvc pipe in the same trench. Is it okay to lay the 2 perforated drain pipes toward the bottom sides (3" from each side in a 18" wide trench, 24" deep) and the single gutter drain centered above. The 3 pipes forming a sort of triangle? That's fine. One 4-inch pipe will handle VAST amounts of water. I can't imagine you needing two. Hi Tim! I have sumpump in my basement I don't have any problem last year but from past January my sumpump run every 5 to 10 sec and discharge 10 to 15 gallons of water every min .i call the basement guy to fixed , they told me this is spring water and I check the water in lab if there is any leek of public water the result is spring water. How can I solve this problem? Purchase my Linear French Drain DVD and put one in at your home. My home is in a suburban city where the homes are very close to the neighbors. I have about 2' from my foundation and the neighbors driveway. Would a trench drain work here or would it actually direct more water towards the home? I'd have to see photos and possibly a short video to fully understand all the dynamics of both overland and subsoil water movement in and around your house. A 2-foot small area next to the house is not much to work with, that's for sure! Laura, Yes the measurement you give will work. I'd put them though at 60 degrees not 120! Thank you, I meant 120 degrees between the rows, so, 60 from the lowest point? or 60 between the rows? 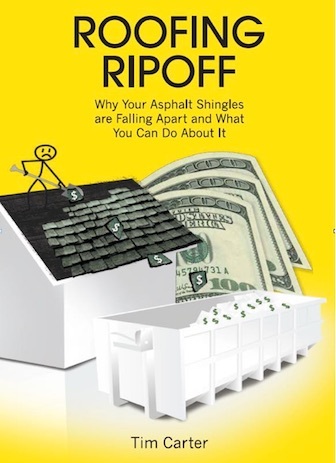 I recently bought a home via an estate sale where there was significant water intrusion and mold in the crawlspace. The sellers agreed to spend $8,000 for a french drain around the entire interior crawlspace perimeter, a sump pump, 15 mil vapor barrier, and a santa fe dehu. We were told that this was common in the area, and that this would take care of the issue. The house is U-shaped with a courtyard design, and the crawlspace floor is on average 4 feet below ground level (2600 sq ft). All gutters are clean and downspouts are diverted 6-8 ft away from the foundation. All that being said, water is seeping through the block around the entire crawlspace. wondering if the linear french drain would help? The fact that the crawlspace floor is 4 ft below ground level leads me to believe that the drain may not catch this water. A landscape architect mentioned that the house could have possibly been built on a spring due to the extreme sogginess in the backyard and parts of the front. After 45 years I would have expected there to be significant damage if that were the case. The landscaping is also original to the home. Would these roots be aiding in the water intrusion as well? A linear french drain WILL SOLVE the problem. Purchase my DVD that shows you step-by-step how to install it correctly. Will do Tim. Do you recommend that I dig to the footer (4 ft)? Or will your recommended 2ft depth suffice? The problem is that I don't know if it's ground water or surface water that is penetrating. I just want to make sure that I get this right the first time. Tim, i have a sump pump that runs constantly. When the power goes out if i have to make sure the generator runs or i will get flooded. Can these linear french drains help me. I'm told my problem is with groundwater. In other words if the water is coming up from under the foundation. Would a french drain help? Jeff, if you send me photos of your situation and schedule a phone consult with me, I'll be able to give you a Yes or a No. All my consults are MONEY BACK Guarantee. Purchase this phone consult and then send me photos. I had a french drain installed last week to fix a problem with water pooling beside my foundation. I also had gutters installed. It rained two days later and water pooled up once again, right over where the drain went in. It took about 24 hours for the water to drain, and it's still terribly muddy. How long should it take for a french drain to drain away a pool of water? I live in Southwest Louisiana where the land is pretty swampy. I am having trouble with water pooling in the crawl space and loosening the soil underneath the blocks, resulting in a sagging kitchen floor. Not sure exactly how deep the water table is- my question is do I go ahead and dig the trench 24" deep regardless or should I stop an inch (or more) above where I hit water? Im no expert but have some info that may help. Water tables are not static, especially a perched water table. You should dig your trench at least to the depth of your footing. However, It is difficult to dig in a muddy water filled trench. Start digging until you hit water. Then dig that trench downgrade...the water will drain away. It may take a few days or more depending on how saturated the ground is. Once the mass of water is gone dig deeper, if you hit water again repeat the process. I live in a ranch home in Decatur, GA, and have been wrestling with drainage problems for years now. As with most people in the area, rain always means a wet basement. I have identified the location where the water enters the house, and have considered an interior patch solution. However, common sense says that trying to patch from the inside is only a temporary fix - the water will eventually push through. Ideally, I would like to run a "U-shaped" french drain all around the outside, but there's a driveway and built up front porch which would prevent me from doing that. One basement waterproofing consultant suggested an interior french drain leading to the sump pump, which I found ridiculous. Isn't the idea to keep water out of the basement? Any suggestions would be much appreciated! Correct. Kiran, you need my Linear French Drain DVD. CLICK HERE to get it. I just installed a french drain on my property. Water is now saturating the soil at the end of my french drain. I feel like I just moved my muddy mess to a different spot in the yard. It's been 2 days since I installed it. Any suggestions? I pretty much tell you in this column and all my other articles about this topic that the pipe should daylight at the lowest part of your lot. It appears you missed that part. Thanks for the excellent article on french drains. I have a drainage problem with my townhouse. There is an area in between my home and the next home that is pretty flat, about 30 feet long and 11 feet wide in between the houses. During the rains, most of the water pools next to my wall, so there is a slight slope towards my house. I had a few contractors come and give me a solution, and one was a french drain dug only 12 inches from the foundation of the building, the 12 inches of area re-graded and the french drain dug 12 inches wide and 12 inches deep. My concern is that 12 inches is too close from the house and that there will not be enough slope in the area (which is pretty flat) to drain to daylight... Any suggestions will be greatly appreciated. Would this work if my house is sitting on sand? I've been getting water in my crawl space. I got a sub pump at the lowest point in the house just not drainage pipes. Hi there i am having some floor drain issues in my basement on a house build in 1947 the floor drain was backing up i took a shop vac and was able to release whatever it was that was clogging trap however when i removed the cover i found that the trap has a cleanout plug with looks unable to remove all rusty but there is another hole on the other side of cleanout that is just open and when it rain hard the water will come out of that hole like a geyser and go into the floor drain what could this be? I have water puddles under my house. I live in Australia and I am interested in getting your DVD video and/or getting you to consult. If I buy your video can I then download it? Can you consult over Skype? Yes I can consult via Skype. I do it all the time. I can send you via mail my Linear French Drain DVD. I emailed you all the information and pricing for international postage. I have a single story home built in 1999. I am the second owner. The original owner states that since the home was new that there was issues of water getting into the crawl space. Sometimes as much a 6in deep on the low end. I have had several companies look at it and they all want to install a drain system under the structure and install a sump pump. This is not stopping my water from entering. My thoughts were to go to the upper side of the structure about 6 to 10ft from the outside and put in a curtain/french drain that would almost horse shoe that end of the home. I am not sure of the depth to dig this trench to put in my piping. According to the water line in my crawl space it is about 4 or 5 blocks down.That would be roughly 30 to 36 inches. Should my trench on the outside that I am putting 6 to 10 feet from the structure be this deep also or does it have to be this deep. The upper side of the structure where I think the water is coming in at is subsurface and not surface water. The top of the ground stays pretty dry, I think it as stated is subsurface. Do you have any recommendation on location, depth and width for my trench to install a curtain/french type drain? I have rising terrain on one end of my home. Even though I have a positive grade around my home. After a heavy rain I have standing water in my crawl space and I had a local contractor tell me that my drain needed to be below the level of my footer which is deeper than 24". My footer walls are 6 blocks high. Will the 24" deep drain you suggest work or will it have to be the depth the contractor suggested. Hello my name is Jackie Kramer, I am writing because my basement sump pump is running all the time. My house is a factory build home. It was put in 1995 it has 12-13 block high basement walls. The water table is high i have all sand mainly around. A lot of water come in threw the tile that is in the sump pump tub. I would like to finish my basement but with the water coming in i am scared. I have brought so many sump pumps. I really don't KNOW WHAT TO DO? I have dug a trench for a French drain to prevent water from entering my basement. It is about 4 ' from my house. It is 6'deep, 3' wide at the top then tapers down to about 1' at the bottom. It is 23'long. I am convinced I need to use rigid PVC pipe instead of black flexible tubing. I noticed in the pictures you have that there is no material used to line the trench before putting in the gravel is there a pipe sleeve used. Are these things not necessary? Hey,I'm the guy who put the drainage plastic pipes holes upward to the sky,oh,good grief Charlie Brown,I read and like any good Boy Scout I will email you guys my own testimony,hey,thanks a lot for pulling my harum out of the "ditch"! Is there a formula to calculate the volume of water that can be expected to reach the bottom of a house footer to then be "carried away" by a French drain after a moderate to heavy rain storm? The block foundation walls are about 8-1/2 feet below ground level to the footers. The soil conditions vary from ~10 inches of top soil, then about 2 feet of clay/shale, the balance to the footer being horizontal layers of hard shale. There's a total of about 90 feet of French drain hose installed around the perimeter of this addition to an existing house. The surface area of the fairly level ground around the addition is ~4,000 square feet. The house is located in the northern Pittsburgh suburbs. I have a question regarding a french drain. Will it carry off water from an inside water source (during heavy rain water comes in under basement door) and runs toward wall. Will drain carry it off and how fast? I'm a hydrogeologist among other things. You should really consider ordering my DVD about my Linear French Drain. A 4-inch pipe laying flat can handle hundreds of gallon per minute of flow. The greater the pitch, the more water it can handle. Hello, I live in Texas with expansive clay soil, and wonder if there is anything different you would do due to the soil conditions. I had installed a black perforated drain tile but didn't get it deep enough and the ground is holding water. This time we are going to try and dig deeper and connect the gutter drains too. any pointer on this type of soil would help. I have a garage that sits lower than the ground around it and the driveway slopes toward the garage as well. The walls of the garage sit directly on the slab...no concrete blocks. The soil is right up against the walls of the garage so over time the wood rots out and has to be replaced. I was wondering if I put in a drain at the front of the garage and continued around to the sides if it would be ok to be right up against the garage instead of out several feet. For one thing I don't have several feet along one side because it's right along my neighbors driveway and the other side I have a patio made of pavers. But I was thinking if the gravel went all the way to the slab then I wouldn't have dirt against the walls anymore. And if I put down weed fabric over it to keep out dirt would I put it directly on top of the pipe or up higher? No. Why not bite the bullet and cut out the lower 16 inches of the wood walls and put in two courses of concrete block? All you have to do is temporarily support the roof and walls to do this job. 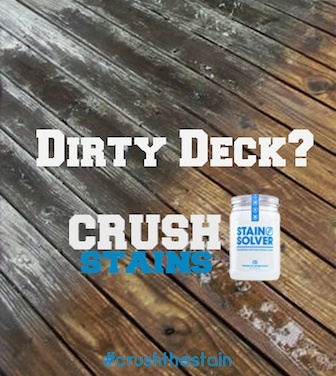 Your method will still have wood in contact with moist gravel. French drains do a really good job at carrying water out of your basement. They are installed alongside the walls of your basement, and will likely be quite effective in draining the water that comes in after the rain. We had French drains installed by a waterproofing company. Hello Tim, I have an 1870's Victorian home in Van Alstyne, TX that is taking on a decent about of ground water during heavy rains. Within the last year I have done grading work around the entire home, buried sheet metal 18" below the base of the brick facade that skirts the house and have installed gutters. After all of this I am still experiencing issues in the crawlspace. I am hoping that I can discover what would be the best plan of action when it comes to installing French drains. I have seen mixed reviews on using socks or landscaping material to prevent material from clogging the pipe. In this heavy clay soil I've been told its a bad idea. Do you suggest me burying the pipe with only pea gravel or do you suggest wrapping the drain in some sort of filtering material? I am going to install some clean outs to ensure I can maintain the pipe. I have seen that many people have been pleased with your method so I would love to have your advice on my project. Thank you. Then you probably need to jump on one of my phone consults and we go over your specific challenges. We have a split level house, with the back of the house the "one story" portion (meaning the lower level of the house is underground on that side). We want to put in a proper drainage system, but are unsure what that would be. Would a regular French drain, as you describe here, work, or would we need something deeper? I notice above you mention that not much water travels through the soil very deep, since there is so much pressure/weight. Thank you for your help! You need to do one of the drains I have in my DVD above. The deeper the better. To ensure you waste NO TIME or MONEY and end up with a dry basement, you should do one of my consult calls. I recently installed a sump pump and weep holes in my block walls in my basement. My water problem appear to not be coming from the surface down but more like from the bottom up as the water table increase. When we were digging the sump, water started pouring into the hole! I have a home built in the 60's with the basement approx. 6ft below grade and not much lower areas away from my home. Would a french drain work to help divert the under ground water away from my basement? Yes, it would help you. I suggest you order my DVD above.